Although PARANORMAL ACTIVITY was among the horror genre’s most profitable movies of all time, its creator, Oren Peli only notches up his second directing credit with the long-delayed AREA 51 (quietly shuffled on to Netflix after a non-existent theatrical release). It’s a formally conventional “found footage” movie, complete with talking head interviews and vox pops involving local people at the sinister central location, a la THE BLAIR WITCH PROJECT. Conspiracy nut Reid Warner and his two pals head to Vegas and, after a side trip to Hooters, execute an elaborate plan to get inside Area 51 that involves breaking into the home of a significant government worker. 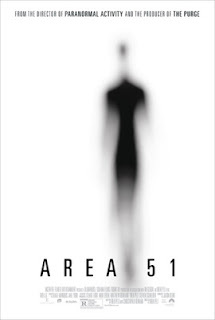 Unlike PARANORMAL ACTIVITY which was pretty much ALL build-up and very effective for it, AREA 51 suffers from a flat build-up hampered by one note, unsympathetic characters. It does, however, pay off with an eerie, well done, tense final half-hour inside the long-discussed title location. The strength of this sustained finale is its enduring creepiness as we glimpse very fleeting and shadowy aliens, space craft, strange moving blobs in laboratories and incidental elements like scores of kids’ toys in one part of the base. The fact that it features at least one character getting dragged out of shot by an unseen force also reminds us that Peli is at the helm. The traditionally downbeat found footage movie ending is followed by an unusual postscript for this sub-genre that shows the footage actually being found.